After attending a State University of New York (SUNY) New Paltz science workshop three years ago, Park Avenue teacher, Mrs. Sally Woglom had an idea. The focus was on demonstrations of “hands on” lessons for teaching a variety of science topics, and one workshop presenter was Middle School science teacher, Mrs. Tracey Waters. The interaction between the two Warwick teachers at the workshop inspired a collaborative, cross-curricular science lesson with classes in Park Avenue Elementary’s third grade and Warwick Valley Middle School’s seventh grade. After three years of wishing and several months of planning, their joint lesson on rocket construction and launching took place in late February. Third graders have studied rocket design and transportation, and their most recent STEM unit of study required the construction of a magnetic levitation train and track system, which tied in well with this project. And in math, the third graders are learning about metric measurement. 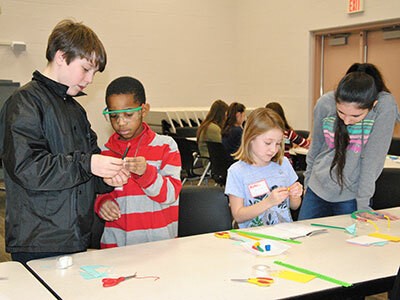 During the collaborative activity session, third graders were paired with Mrs. Waters’ seventh grade mentors to work on rocket design, construction and launching. The joint lesson was successful and fun for both the Park Avenue and Middle School students, and will hopefully inspire more collaborative lessons and projects in the future.